Portugal lies on the west side of the Iberian peninsular. To the west is the Atlantic Ocean, to the north and east is Spain, and the River Tagus divides the more mountainous north from the lower, undulating terrain to the south. The north, more mountainous region is lush while the lowlands to the south are drier. The Mediterranean climate is greatly influenced by sea and landscape. Portugal is only here really so I can slot in Madeira! 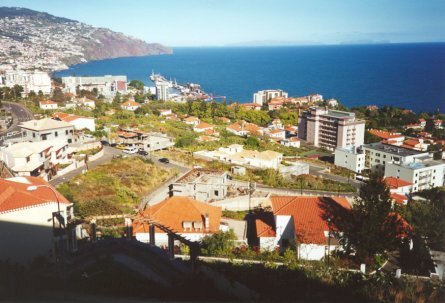 Madeira is one of the few places away from England where I could live. I do like to see a bit of Nature's green all year round, even though this does unfortunately require regular rain. Madeira, however, combines this requirement with a pleasantly stable temperature. This could be something to do with being quite near to the coast of north-west Africa, only 500 km (310 miles) east of Morocco. Madeira is known as a floating island of flowers. Well, you know how folks go overboard when describing places! We stayed in the capital, Funchal, where hotels are principally on two levels to the west of the sprawling city: one level just above the city centre and the other way above the city centre. You can guess which level we were on, knowing my luck, can't you! It was way up above what the locals call Cardiac Hill, so we chose to only walk down on our excursions. We were quite pleased with the quality of our hotel, however, which like many similar hotels, had a free courtesy bus service to the city centre: although it ceased surprisingly early in the evening. If you know that classic British comedy starring John Cleese known as Fawlty Towers you would have immediately recognized our hotel porter as Manuel. So this is for those who know him. The short, ever-willing-to-be-helpful, non-English-speaking, Manuel used to have enough problems showing guests to the correct room. Now transpose this situation to a hi-tech hotel, with Manuel showing Hazel and myself to our room, indicating how the electronic key-card works, how the electronically-controlled air-conditioning works, how you must place the key-card into a special holder in the room in order to get any electricity (a splendid eco-saver, this), and then, consider this situation where the key-card does not actually open the door in the first place and Manuel has to go back to reception to get a special electronic box to reset the system. That was our scenario! Thank goodness there was a complimentary bottle of Madeira wine waiting for us when we finally got into the room. We certainly needed fortifying: and the fortified wine certainly did the job. To my mind, however, I prefer to think of Madeira wine as a sherry: if I'm drinking wine then I want something a little less heavy! If I'm in the mood for drinking sherry, however, then it's a different matter entirely! 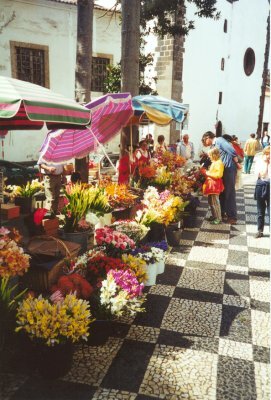 Madeira is known as a floating island of flowers. Well, you know how folks go overboard when describing places! The temperate climate of Madeira does mean that it is pleasantly warm all year round, however, and this is why so many plants thrive. 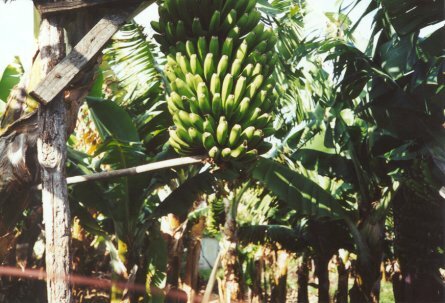 If you are a gardener, imaging that your greatest problem is to decide which fruit trees to grow. Shall it be bananas like everyone else, or is this too boring? A few vines are needed, of course; handy to pick and eat when you get home and are searching for the key, worn out from climbing the hill. Then what about an orange tree by the patio? Or perhaps a lemon? Pity those Arum lilies grow like weeds here. Gosh, what gardening dilemmas you would face! Then, again, perhaps it's no wonder that the garden-loving English have so liked this island throughout recent history. What opportunities for those with green fingers! With a climate not unlike the very best to be had in an English summer, with some rain to keep everything pleasantly green - unlike the Canaries to the south - you can see the appeal. The friendly, peace-loving Portuguese inhabitants also add to its attraction as a tourist destination. They are not only friendly: they are also a picture of health. All the girls are petite and extremely attractive and, if my wife is to be believed, all the men are profoundly handsome. I has to be said, though, that people do also get old here and lose some of this gloss - even in such paradise. If you like sand with your sun, and beaches with your bathing, then you should probably go somewhere else - although there is one delightful, sandy, artificial beach at Calheta, in the south! 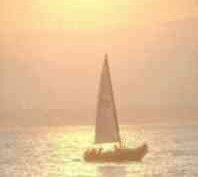 (There's not much else there except a marina - so great, if you arrive in your own yacht.) 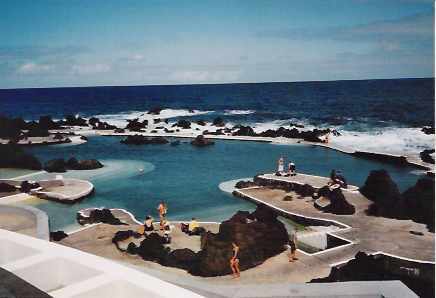 Elsewhere, if you want to swim, you have to either stick to the hotel swimming pools, visit the spa in Funchal, pay a visit to the other nearby inhabited island of Porto Santo, or maybe visit Porto Moniz in the north, where there are lava swimming pools (more of this later). The volcano-spewed island of Madeira shot up through the sea without any thought to such provision, and typical coastlines are vertical. 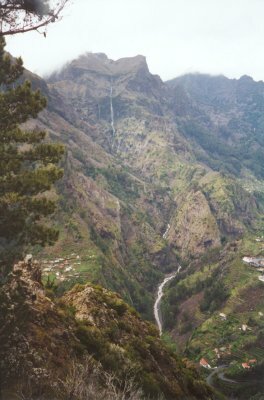 There is some splendid mountain scenery as a result, with tall waterfalls and low-lying villages: some actually in volcanic craters and hard to reach, like Curral das Freiras, or "Nun's Valley" as it is known. Here you'll find beauty by the crater-load - unlike the aftermath of most other volcanic creations! The soil is so rich here! Madeira is just 56 km (35 miles) long and 21 km (13 miles) wide. On my first visit, zipping around it in a car was far from easy due to the narrow and torturous roads. The island's mountainous terrain then ensured any distance you travel horizontally you also doubled by travelling vertically! 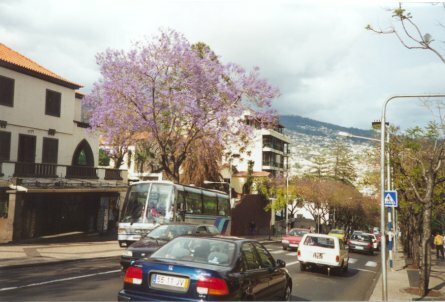 But that is a lot different now, thanks to lots of EU money, countless mountain tunnels, flyovers, and a motorway along the south from near the airport and then west, taking in Funchal. This is fast and narrow for a motorway, though, so be warned. The highest mountain, Pico Ruivo, is 6,109 feet, so don't underestimate the vertical element of this island formed, as it was, from a ring of volcanoes. This fertile land was originally covered in forest and it took some seven years of burning when it was first inhabited to gain sufficient space to build and live. As it is, the steep slopes mean that it is often necessary to create terraces in order to grow anything or to build. 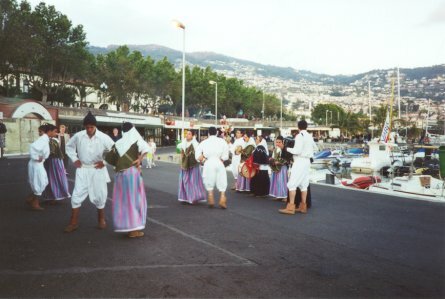 The first primitive borough began in a beautiful valley where the fennel (funcho) grew and, for this reason, it developed to become the island's capital having the name of 'Funchal'. 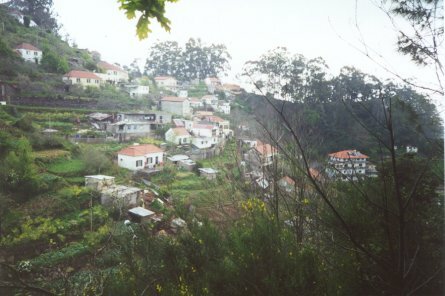 Villages used to be very isolated and, even today, there are some islanders who have never even visited Funchal, let alone left the island. It is not surprising that the island has many micro-climates and there is saying that it is possible to visit all four seasons in a single day when travelling around the island. The northern coast is rather different to the more inhabited south coast, the latter more popular because it has a dryer climate. 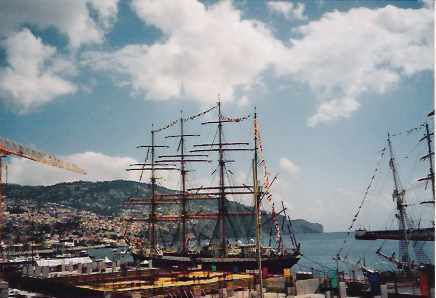 This is where Funchal, is situated. They get far more rain in the north and on the mountains, and in order to irrigate the land and to get sufficient water to other parts of the island and for electricity generation, the early settlers invented a method of moving the water to where it was required using long, narrow water channels called levadas. 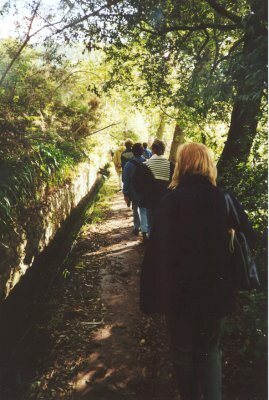 These levadas are to be found all over the island and, because they take practically level courses that follow the natural terrain, the adjacent footpaths make for some lovely walks through all kinds of scenery. The only drawback is that these paths are often quite narrow, sometimes extremely so. I particularly enjoyed the easy levada walk from Choupana to Rochão, stopping over at Camacha for refreshments at the local inn. I'm not so sure the locals are entirely happy that their little village inn was overflowing with tourists, however, although the owner didn't seem to mind very much although it was giving his till an unreasonable bashing. Don't let me mislead you into thinking that the levada walk was full of tourists, having said this. There are also many other more remote levadas to walk, including one to an enchanting place where 25 water sources meet in the Valley of Rabaçal. Getting to places is really something you need to plan in Madeira. Getting to places is really something you need to plan in Madeira. It's not that there aren't plenty of options, more that it is best to plan your stay for, even if you intend to do a lot of walking, you still need to get to and from your start and finish points. Not that there are not a lot of trips to choose from if you want someone to make that easy for you - although prices vary considerably, so do not plump for the first offer. 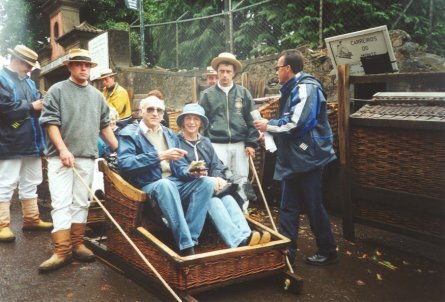 Madeira is, of course, a walker's paradise. So let's consider the options. You could hire a car, and there are plenty of companies to help you out with this, for as long or short a period as you like. But how is your driving? Are you good at hill-starts on 45° inclines? Can you reverse down or up such slopes, including passing between parked cars and stone walls with only a few inches to spare? How would you feel backing up on a narrow, twisting, mountainous road with a one-foot wall separating you from a thousand foot drop? How do you feel about navigating around and through the surprisingly large Funchal where even the main road in passes through tunnels, across tall bridges, and ducks and dives under, over and around other roads in something that resembles a 3-D maze? Here is a place where you can see somewhere on an adjacent road and not have a clue as to how to get there! If this raises any concerns for you, then take one of the other options! If you think I am going overboard as usual then, frankly, I deny it - this time! The other options are the ever-present and reasonable taxis - 98% of which are yellow Mercedes, the biggest cars on the island - and the range of buses. You need to check the buses out carefully and it is best to buy a ticket for the local ones at a booth or possibly your hotel before your travel, noting that a 'return' - really just a 2-trip ticket in either direction - costs very little more than a single. It is as well to be aware that several bus companies operate different routes on the island and they do duplicate numbers. The buses do have different colours but, if you only know the number of a bus and are also colour-blind you might just have a problem. If this is the case, take particular care if you give any thought to travelling to the northern coast by bus. These routes are not very frequent and you could be in for an unexpected overnight stay or a long taxi trip if you get it wrong. The coach drivers on Madeira are a special breed. They drive these kind of narrow roads and back-streets like they were 3-lane highways, handle 45° inclines with panaché, turn round where you would think twice about doing the same with a small car, squeeze between stone walls and parked cars with millimetres to spare. On one of our trips to a high mountain viewpoint we ascended a narrow-twisting road with a low-little wall separating us from a drop of thousands of feet, only to meet a taxi coming in the opposite direction. The road was not much wider than the coach, but the driver backed up a hundred yards without a second thought to a place where he had to persuade the taxi driver to tuck his big Mercedes into the bushes next to a rock wall so we could scrape pass. Exciting stuff! Many people are, I feel, a little bit cruel about Funchal when they talk about how busy and noisy it is. What city isn't busy with traffic but, in this city, there is always something beautiful near-to-hand to counterbalance this frenetic activity: far more than most other cities could boast. 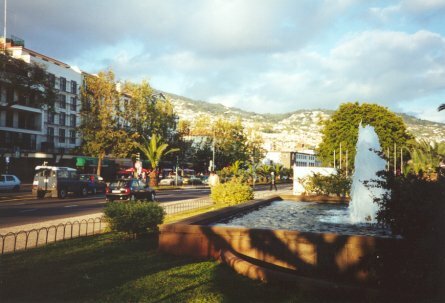 The city is well kept, the pavements are clean and pleasant in themselves with their mosaic, black-and-white appearance, and Funchal also has great character. So, let's just set the record straight! If you stay in Madeira, however, you cannot get a true picture of the island unless you travel outside the city limits. But I do believe it is a good plan to be based in the city since this is the hub of the island - and the hub of transportation to take you anywhere else you need. Stay here and you can be car-less and care-free! 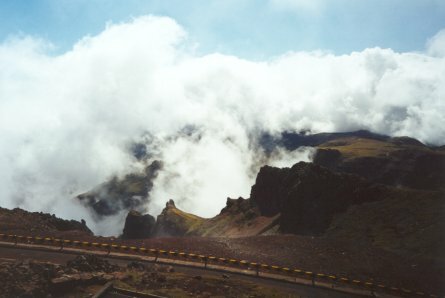 The mountains up behind Funchal are frequently enshrouded in cloud. Even as you watch this situation changes. The rising hot air is responsible for the precipitation that the city is quite used to, but given that this is interspersed by pleasant sunny weather, this is worth having since it keeps everywhere so pleasantly green and helps provide the water supply. Weather forecasting over the whole island is hardly worth the effort, and it is best to be well prepared for anything from sun to a cold breeze or showers. No wonder the English feel so much at home here! But the bottom line is this: it never gets too cold or too hot - except at the top of a mountain, where it can be freezing. By the Funchal Marina, at the lower-level, are a variety of cafés/restaurants and you might chose to consider these for a meal. If you do, be prepared to run the gauntlet of their sales-persons who will all attack you with the merits of their own establishment. We relented and ate at one marina-side establishment one evening, soon to be entertained by a group of folk dancers. This area stretches to the west of the centrally located jetty known as the Pontinha and is easy to miss since you have to descend a ramp or steps to even find it. Near the jetty you will most likely also be accosted by those undertaking 'surveys' that end in a lucky dip by way of thanks. With the skill of conjurors these people ensure that one from each couple is a lucky winner of a free meal at a good hotel, a free vacation, a free taxi trip up there, and goodness knows what else free. The catch? Goodness knows, they don't usually mention time-share, so I'm sure it couldn't be anything like that. Still, now you can be even less surprised at your luck than they are when one of you draws a winning ticket, and you can consider whether you want to get drawn into that sort of thing when there are much more worthwhile things to do on the island before the question even arises! Or, you can sit and have a snack and watch them in operation. The good ship Vagrante is in dry-dock right there by the jetty, and upon its deck you can enjoy an ice-cream or cake and coffee. This ship was once owned by the Fab Four - the Beatles, no less. So enjoy some time-out here and wonder why it looks so unlike a yellow submarine. Adjacent to this, on either side, more snacks are available where you sit in make-believe boats on make-believe waters, under make-believe skies, without any fear of sea-sickness or being accosted by Sergeant Pepper. Just opposite all of this is the impressive white fort (Fortalez de São Lourenço) and Parliament House. For my second trip to Funchal I was delighted to discover it coincided with the 500 year celebration of habitation, and the Tall Ships were coming in force to help celebrate. This included the world's largest sailing ship, the Russian Sedov, with its four giant masts rising over 200 feet above water level, and its length an amazing 385 feet. The public were allowed on board many of these ships and it was great to see this one - and to look up the masts from deck level, as tall as the tallest trees I ever did see. The crew were smartly dressed, but the deck hands, or trainee lads, were poorly dressed; but I guess you wouldn't normally notice that when they were scrambling around in the rigging. Just imagine that if you will! To cause general confusion, but to ward off people telling me in cannot be the Sedov in the picture, be aware that while it is normally white, when I saw it it was black. Clear? Apparently it had recently been painted for the sake a film, The things these producers insist on, eh? Or was it some diva? Back on land, the Sé - the cathedral - and the Sé quarter, is not far and here you will find some pleasant open-air restaurants where you don't get bullied to go in. Try one after visiting the mini-cathedral: much more impressive inside than out. I particularly like the Café Funchal where you can get simple food served in pleasant surroundings, well supported by the locals. Similarly, there are some nice open-air cafes facing the harbour. Here you can eat and watch life pass you by. You can also watch the dogs either pass you by or play together in happy companionship. The charming little mongrels are all very appealing little creatures, never a pest, and they survive well as buddies in this environment. They are particularly seen between this area and the Old Town to the east: where those with gastronomically-challenged appetites might be better advised to stray. One great mystery to me was how, given the number of free-running dogs there are around these areas, there never seems to be any accompanying mess. Strange but true! Where people have dogs as pets they often live out-of-doors in kennels. A less attractive feature of the Funchal dogs was that they rather like barking all night long. Perhaps they just wanted to get indoors. On my second visit, there seemed to be far less dogs around. Wonder what happened? Don't like to think! If you like shopping, many of the shops are hidden away in various shopping arcades dotted around the city, so look out for these. Don't, however, expect any large shops or chain-stores. Madeira is not quite like that: it has more character. Part of this character is the Worker's Market (Mercado dos Lavradores) near the Old Town, where you can buy any of the island's specialties. One of these is the scabbard fish, the espada, a fearsome-looking jet-black eel-like beast that is typically up to a metre in length. 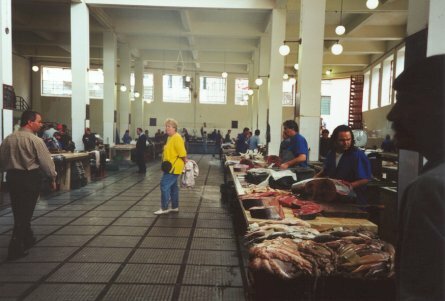 In the fish market you will see many of them displaying their needle-sharp teeth. You can they trot off to just about any restaurant and get your razor-sharp teeth into it, if you feel so inclined: traditionally laced with banana! What ever you do, don't confuse this espada black eel monster with the other famous island dish espetada, a typical Madeiran meat dish, really a kebab of beef, traditionally threaded on a laurel stick. Also, while on the subject of confusion, it is as well not to confuse the ladies toilet (Senhoras) with the gents (Senhores) or, less confusing, Homens. Don't be afraid to explore the rather sleazy-looking old town to the east of the Worker's Market. This is what the town used to be like. Keeping to the seaward part of this you will find the gastronomic gems you may be seeking, otherwise surprise yourself at the apparent poverty of the streets which look almost like warehouses but are usually homes. While we strolled in this area we came across a street cordoned off by armed police. It took them some time to root out their objective, no doubt hidden in one of the shady-looking backstreet houses, but then life went back to normal. 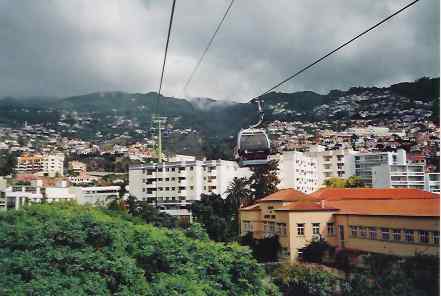 if you're feeling brave, take the cable car from the old town of Funchal up to Monte. if you're feeling brave, take the cable car from the old town of Funchal up to Monte, high above Funchal, famous for the Church of Our Lady of Monte. You really wouldn't want to walk there, and you can take a bus, but since they invented a rather nice cable car for our second visit, I would highly recommend that. It gives you a delightful ride, with a wonderful view - although the faint-hearted might not like to keep their eyes open. I would. Just imagine you are in a plane. If you're still feeling brave when you get up there, two white-clad charioteers will control and guide you 2km down a hill on a wicker contraption. Walk down the steps opposite this door and you eventually are led to the starting place of the famous Madeiran toboggans. If you're still feeling brave when you get up there, two white-clad charioteers will control and guide you 2km down a hill on a wicker contraption. Down a twisting street, that is. Interleaved with traffic... doing their best to steer it and stop it at a couple of road junctions in case you otherwise implant yourself into the side of a bus. If this frightens you at all, consider that it used to be really fast before the more recent slower surface. I assure you they are ace at missing the protruding manhole covers and straightening up the sideways slides, traffic using the road is quite patient, and I didn't see one man slip or lose his grip, so there is really nothing to worry about at all. If you are worried then go in the rain like us when, as we found, it is really slow! Personally I found it far too slow - I am such a daredevil - and the men pulled as much as they rode. 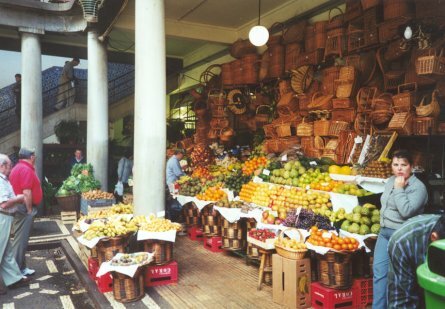 Originally this scheme was designed as a method for getting produce down to market in Funchal. Now it is all about producing growth from the pocket of the tourist. It is, however, an obligatory Madeiran experience, so you must do it! (Everyone will ask if you did!) Nearby are the Monte Palace Tropical Gardens, worth a visit if you are interested in seeing the wide variety of tropical plants that grow on the island, and the tiles and porcelain that sprouts among them in a rather bizarre fashion; personally I prefer my porcelain on the table. 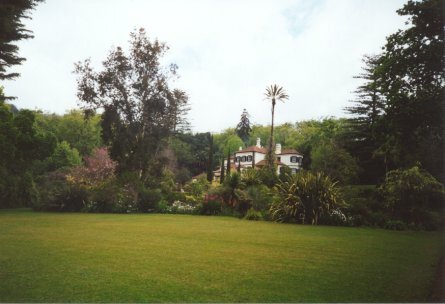 I also preferred the gardens at the Blandy mansion known as Quinta do Palheiro, east of Funchal, as being much more natural. The Blandy's really seem to have got Madeira sewn up and certainly have fingers in all the paying pies of the island, from tourism - they have a Travel Agency that runs tours that I can highly recommend - to being the producers of the most famous brand of Madeira wine. John Blandy first set foot on the island in 1807 when, as a 23-year-old soldier, he was posted to the island with a British Army garrison sent to help the Portuguese thwart any attempt of invasion by Napolian's navy. As quartermaster it was his good fortune to come into contact with the local wine merchants and, with the taste still in his mouth after he left the army, he returned in 1811 to found the company that still bears his name. So with tourism as the major industry and wine a strong and heady second, the Blandy's are well placed to keep up their Quinta. 'Quinta' is the name given to the palatial homes that merchants set up on the island to live in pleasant surroundings and from which to run their wine empires. You can savour some of this by touring the Blandy-owned São Francisco Wine Lodge in the jacaranda-enshrined Avenida Arriaga, virtually adjacent to the lush green haven of the small gardens known as Jardim de São. Time it right, twice a day (10:30 am and 3:30 pm), and you can enjoy a one-hour tour through the oldest working wine lodges in Funchal. 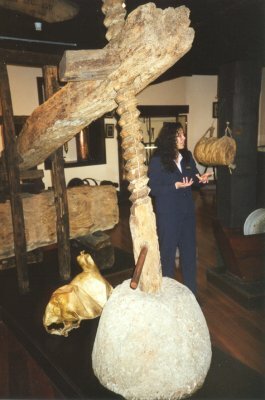 You get to see huge ancient vats of choice wine, a film, and a wine museum and old wine presses. You also get to taste the end product! Get there early and state your language preference in the hope of promoting the correct guide, although this should not be a problem if you speak English. The young lady who took us around was keenly interested in her work - who wouldn't be? 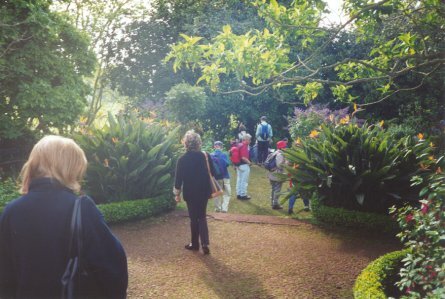 - and was typical of most of the island's guides; at least, I can say that of the Blandy ones, since we took several trips arranged by the Blandy Travel Agency (Agência de Viagens Blandy) located on the Avenida das Comunidades Madeirenses. Their trips are quite a bit more expensive than many others that are available but, if you prefer an English-speaking guide to a bus that has pre-recorded tapes in several languages, it is worth the extra for the personal touch. On our second visit we took a coach trip to the north, which included a visit to Porto Moniz. Here the natural spilled lava from the volcanoes created natural swimming pools that are filled by sea water. Apart from an aquarium, there is not much else there, and they clearly don't like the visitors - or locals, come to that - for getting too amorous - or friendly, even. Where you would expect to see normal seats on the promenade you will find single-seaters, strategically placed such that there is about a two-foot gap between them - even a stretch to pass over a sandwich. What is that all about? Judging by the shape of them, I imagine the answer given would be 'design'. Strange designs, methinks. You would have thought that with tourism as the major industry, it would be considered important to ensure that everyone employed in the travel industry was friendly and welcoming to tourists. Surely this makes sense? Yet I was surprised on entering what my guide book described as the 'friendly tourist office' to find two grim-faced portly ladies, sitting at adjacent desks like matching book-ends, who clearly thought that foreigners disturbing their peace were not to be encouraged. (I've met a few street-sellers in different parts of Europe that seem to have a similar aversion to their principal source of trade. How do we educate them?) Still, you know my luck, perhaps they were both just having a bad day or my face was too long. I cheered up a bit at the sight of the flower-sellers just along the street: a much more colourful scene! That was some years ago, though, so maybe they've been recycled since then. As I said earlier, the build of these two ambassadors was in stark contrast to most of the inhabitants who have shapely, petite figures. All the girls have great bodies and all the men have great girls! That's what it seemed. Romance certainly blossoms among the jacaranda trees, in the parks, along the shore ... in fact, anywhere. O to be young and alive in Madeira! When we went back, however, we noticed a big difference in the teenagers. Whereas they were shapely and well-dressed then, now they are like teenagers everywhere else, attached to mobile phones, built differently, and potentially as loud as their counterparts in other parts of the world. I guess that's the nature of progress. For a good choice of hotels with discount prices, visit Hotel Reservation in Madeira for more information. If you enjoyed reading the above article then you will probably also enjoy Tenerife by Ed, and Sicily, also in Europe, and our latest articles covering the Orinoco Delta, La Mata, Marbella and Beijing.